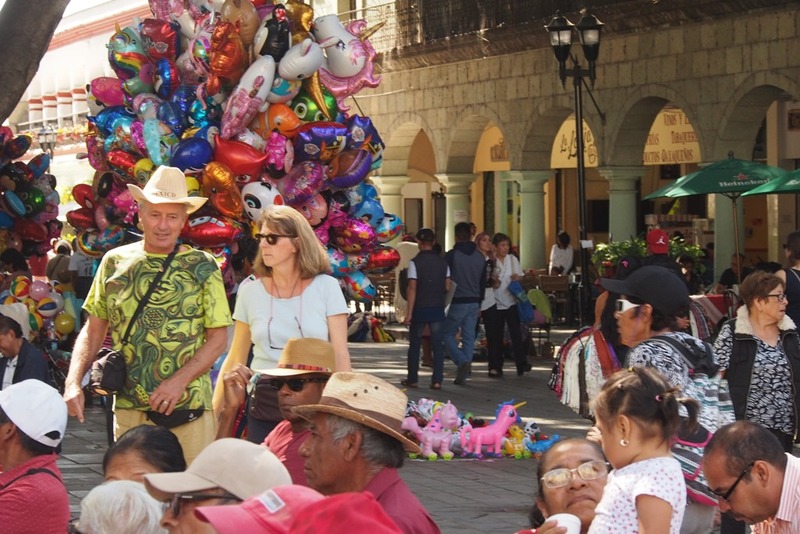 It was a typical Sunday in the Oaxaca zócalo, the busy plaza at the city’s center. Balloon vendors and peddlers of handicrafts and plastic toys plied their wares while tourists and local families strolled by or stopped for meals at the restaurants which line the outside of the square. At one end, the radical teachers union was holding a rally—complete with a brass band and traditional folk dancers–marking marking the International Day Against Violence and Exploitation of Women and calling for an end to impunity. At the other side of the zócalo, close to the walls of the Cathedral, a student brass band was setting up for a concert. Huge trees kept everyone mostly sheltered from the hot sun. One element was new: over where seats had been set up for the brass band’s audience, a line of about 100 people snaked around the plaza headed for a shaded spot where a table held two big, white boxes, labeled “Consulta Nacional.” It was voting day for th e second plebiscite organized by Andrés Manuel López Obrador, Mexico’s president-elect. His inauguration still a week off, AMLO, as he is known, appears to be already running the government. The “consulta nacional,” or national consultation, is one example of how the popular leader is keeping attention on his assertive agenda. At the top of his agenda, or at least at the top of today’s ballot, is a proposal to run high speed trains over a 1500 kilometer track to be built from Cancun south through the busy tourist corridor of the Mayan Riviera, across the Yucatán peninsula alongside the borders of the Calakmul Biosphere Reserve to Campeche, south through Tabasco (AMLO’s home state), ending in Palenque, home to a major archaeological site in the Chiapas jungle. The project is known as the Maya Train. 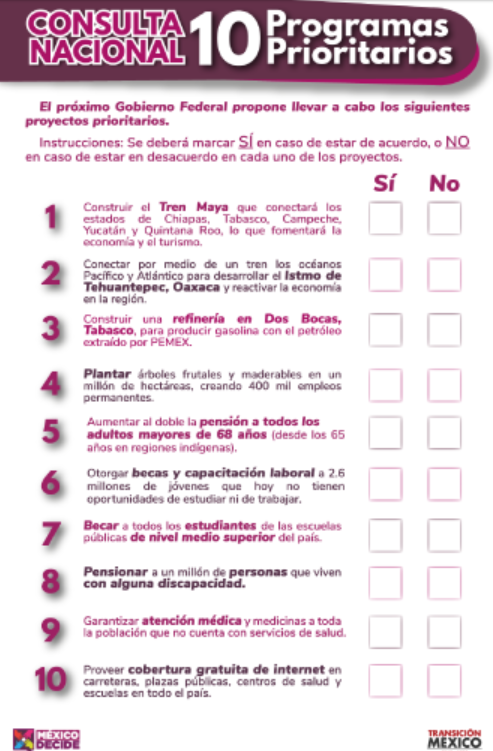 Questions on the “ballot” include others aimed at spurring development in the generally poor south and southeast of the country, including a proposal for another transportation corridor across the Isthmus of Tehuantepec and modernization of industrial facilities on both the Pacific and Caribbean coasts. AMLO also proposes major investments in fruit orchards, which he says would restore the environment and create 400,000 jobs. AMLO’s plans for big projects in the south and southeast are reminiscent of older plans from recent neoliberal administrations, as well as the US-backed “Plan Puebla Panama” development corridor. His campaign, however, was largely based on a pledge to end corruption and respond to the needs of ordinary Mexicans. 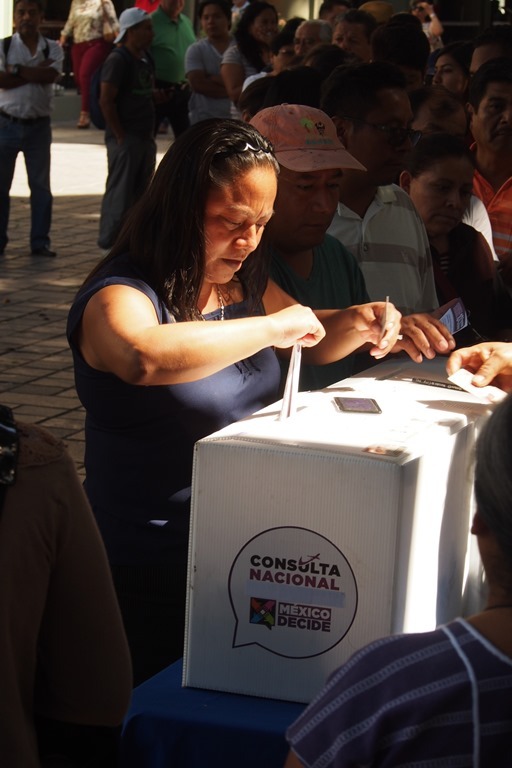 We did not ask them how they intended to vote, but from their pro-AMLO enthusiasm, we expect the votes to be positive. At the other end of the zócalo, close to where the teachers were rallying, three young women were peddling notebooks to raise money for their collective. The notebooks carried pictures of iconic rebels, including Emiliano Zapata, Frida Kahlo, Charlie Chaplin, and Mafalda, an Argentine cartoon character whose image is popular with Oaxacan radicals. 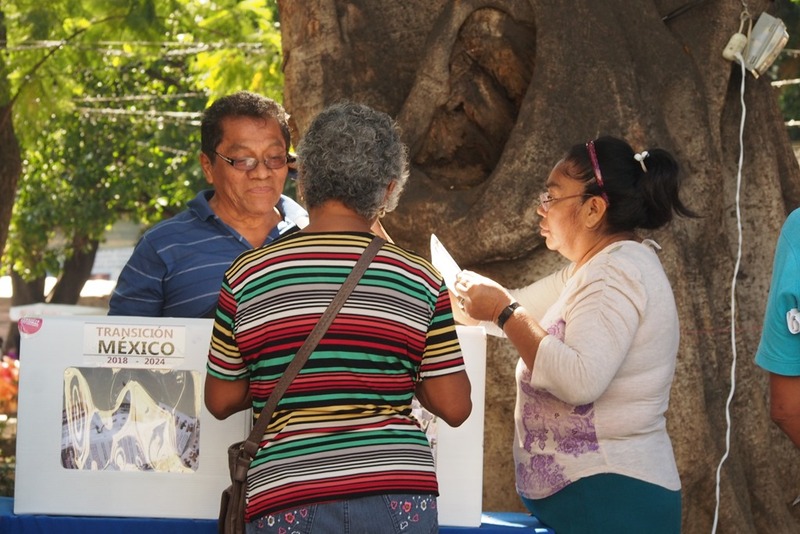 When we asked if they planned to vote in the consulta, they all shook their heads. The first people who should vote on the megaprojects, they agreed, are the indigenous people in the areas where the projects will be built. 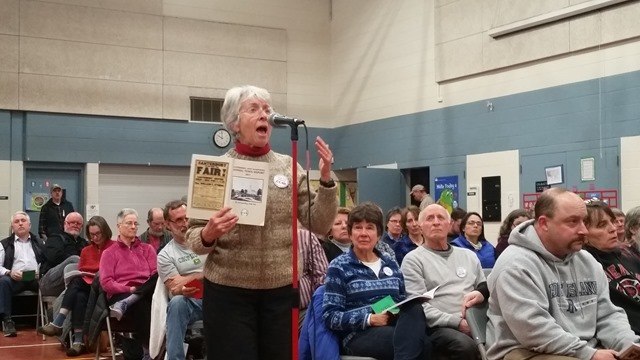 Even to vote “no,” they said, is to legitimize a development path that is already underway. That does seem to be the case. In fact, AMLO outlined the details in a July 12 letter to President Donald Trump, in which he stated “this project will be carried out without detriment to our sovereignty and will be promoted with the participation of the public, private and social sectors. In this case, as in any other project, environmental impacts will be taken into account and the rights of the villagers and land owners will not be overlooked, on the contrary, they will be taken into account, consulted and incorporated as substantive part of the project.” As the incoming president put it, the development projects will create opportunities for young workers, thereby reducing pressure to migrate. As for the Mayan communities in the Yucatán, they seem less than impressed with the train which would carry their name. 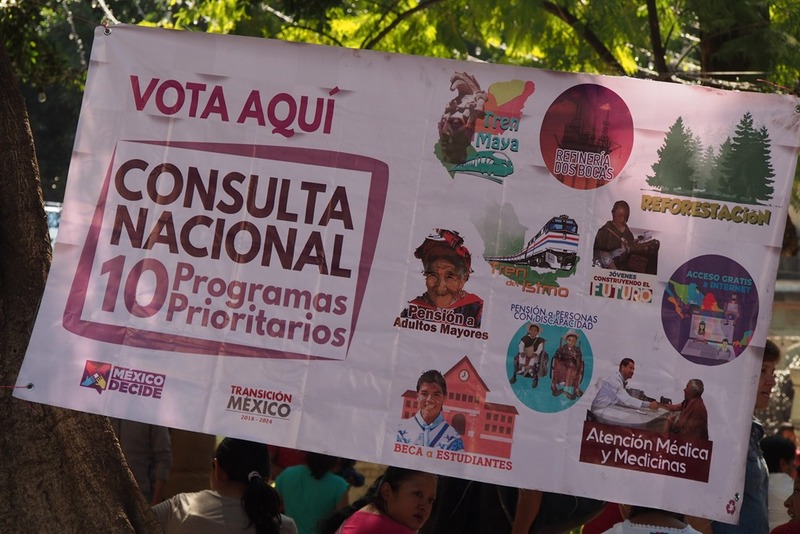 In a recent letter rejecting the megaprojects and rejecting the consulta, a dozen indigenous groups from several states told the incoming president they have been following the proposed Maya Train for some time and hoped AMLO would come in with more respect for their perspectives . “With respect to the so-called consultation, from this moment we reject any result whether it is for or against. It is not permissible for anyone, any person outside the Yucatán Peninsula, to decide what to do or not to do in our territories,” they said. 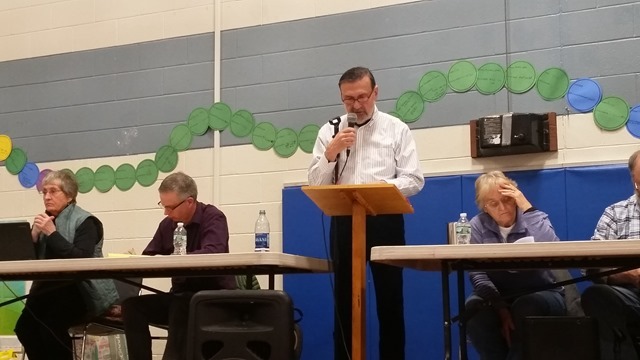 “No to megaprojects that strip us of our territories,” the letter concluded. 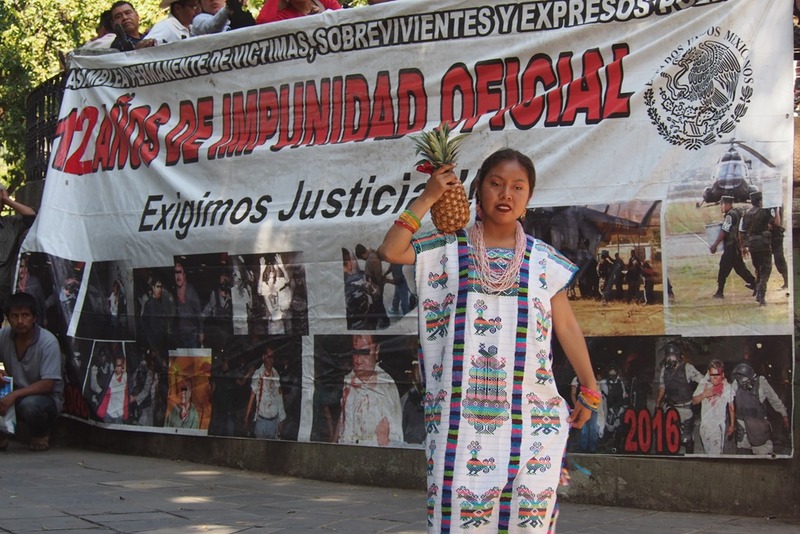 Similar statements have come from indigenous communities in Oaxaca. And yet another letter went to the president-elect from a group of influential artists and intellectuals, reminding him that the International Labor Organization’s Convention 169, on the rights of indigenous and tribal peoples, to which Mexico is a party, requires the government to consult directly with affected indigenous communities before going ahead with projects like the Maya Train or the trans-Isthmus transportation/industrial corridor. No “national consultation” can substitute for that process, they pointed out. Regardless of the outcome of this weekend’s vote, debate over the Maya Train and other massive development projects is far from over. POST SCRIPT – About a million people, or 1% of the electorate, cast ballots nationwide, with all the proposals gaining approval from about 90% of voters. See the official results here. Concerned about militarism? Watch the budget, not the parade. This was published first in the Concord Monitor on February 15, 2018. President Trump’s proposal for a massive military parade has aroused bountiful criticism, including from 89% of the 55,000 Military Times readers who responded to an online survey. But if we’re concerned about a slide into military rule, I’d suggest looking away from the parade and paying more attention to the budget just approved by Congress. “There is widespread agreement in both parties that we have cut the military too much,” observed Speaker of the House Paul Ryan just prior to the vote adding some 165 billion dollars to the Pentagon budget over two years. Of the bi-partisan consensus, the Speaker was correct. The Democratic Party’s talking points seemed to be that they, too, wanted a higher military budget although they would insist on a boost to non-military spending, as well. Even the Congressional Progressive Caucus, which to its credit has put forward an annual alternative budget that shifts funds from military programs to domestic priorities, issued a statement about the parade but said nothing about the budget its members had just voted on. As to cuts in the military budget, Ryan’s analysis needs scrutiny. While the military budget has indeed dropped from its peak at the most intense times of the wars in Afghanistan and Iraq, inflation-adjusted defense spending levels are now higher than they were during the U.S. war in Vietnam and most of the Cold War. The FY 17 level of spending, $634 billion, takes up more than 50% of the discretionary spending approved by Congress. And that doesn’t even count the money going to veterans’ affairs, homeland security, the secret budgets that fund the CIA and National Security Agency, or the portion of the Energy Department’s budget devoted to nuclear weapons. The non-military part of the budget gets boosted by a lesser amount: $63 billion the first year and $68 billion the second, bringing its share to $605 billion. If you do the math, that means military programs will continue to capture 54% of the funds in the “discretionary budget,” that is, the budget Congress controls with annual appropriations. It’s that figure, more than the number of generals in the cabinet and the size of Trump’s parade, that I find alarming. The details of the budget still need to be worked out, but there’s little doubt it will include down payments toward a new generation of nuclear weapons. Not only is the Trump administration continuing the Obama administration’s plan to replace the entire array of nuclear warheads and the planes, missiles, and submarines designed to deliver them, the recently released Nuclear Posture Review calls, as well, for new mini-nukes that could be deployed and presumably used on the battlefield. The official price-tag for the package is now $1.2 trillion, but some analysts, including former Defense Secretary William Perry and General James Cartwright, former vice chairman of the Joint Chiefs of Staff, think $1.7 trillion is a more realistic estimate. Perry and Cartwright believe we’d be safer by spending less. “If we scale back plans to replace the nuclear arsenal, we will actually improve our security,” they wrote recently in the Washington Post. They advocate cancelling plans for new land-based and cruise missiles, for starters. Our actual security is better protected by reducing nuclear threats through multi-lateral reductions consistent with the terms of the Non-Proliferation Treaty, global attention to climate change, creation of civilian jobs that pay living wages, ending racist and patriarchal violence, and prioritizing housing and health care. That would be worthy of a parade! Remember a few years ago, when those talking about “tax reform” said they wanted to lower corporate tax rates, but would close loopholes to balance the impact? That’s not what’s in our stocking. NPR says, “Trump might get the gift he’s been wanting for a while right before Christmas.” It’s not just a political gift; it’s a gift to the investor class, of which the president is, of course, a member. But maybe “gift” is the wrong term. After all, the tax bill Congress will vote on this week is the result of untold hours of work by literally thousands of corporate lobbyists. Think of it more as return on investment, investment in political influence, that is. The NY Times reported that the Business Roundtable, “desperate to remove the corporate alternative minimum tax, worked behind the scenes, calling lawmakers and raising concerns about how it would effectively kill the ability of companies to utilize the prized research and development tax credit.” They succeeded. The GOP bill ends taxation on most of the foreign-profits gained by so-called “American” firms, a measure that has long been on the agenda of the multi-national corporate lobby. Take a look at this 2013 report from the Heritage Foundation, which says a “territorial tax system would create jobs and raise wages.” The argument goes something like this: if multi-national corporations are taxed less on their foreign operations, they will have more incentive to invest in job-creating enterprises in the USA, and that will create jobs. In other words, take a walk on the supply side. Not only could this have been predicted, it was. I’m currently reading People Get Ready: the Fight Against a Jobless Economy and a Citizenless Democracy,” by John Nichols and Robert McChesney, who single out the tax system as an example of the rigged system. “Americans are told that tax cuts for the wealthy and for multi-national corporations must simply be accepted on faith as the necessary cost of doing business in modern times,” they write. If you didn’t look at the title page, which says the book was published in 2016, you might think you were reading the morning news. It’s not all over; there’s still a chance that two or more GOP Senators could rebel. If you live in Maine or Arizona, pick up the phone and call your Senators.